I developed an online version of Art History I (Caves to Cathedrals) in Spring 2015 and taught a single section in Fall of the same year. I designed the course knowing that most of the students would be studio and graphic artists, residential students and online students from all over the country, a mix of traditional and non-traditional, non-art-history students. With that in mind, I posted a request for suggestions to AHTR’s Facebook page and received some interesting ideas, such as collecting images on Pinterest, and using Google hangouts, something my students chose to do on their own mid-way through the project. Most of the feedback I received, however, warned of the difficulties of online group projects. Yet, my department required a collaborative effort. After much research I decided to forego the traditional research paper and have my students work in small groups to create online exhibitions. I had used the virtual exhibition assignment previously with great success in on-campus classes with non-majors and adult continued education. The difference would be that instead of using PowerPoint, my online students would use an online program: Google Art Project, something several colleagues suggested on my AHTR post. The students had smaller assignments due each week specific to weekly content, but the Collaborative Exhibition Project was to run as a unifying thread throughout the course. I envisioned my students working together in a virtual collaborative environment as they learned about art and produced a final project that had more relevance to their lives as artists than a traditional research paper. That vision was shattered in Week 2 when I was bombarded with student emails imbued with confusion, desperation, and anxiety about how they were supposed to work as a group online, when everyone lived in different time zones, and how to come up with possible themes for Step 1: Initial Ideas. By Step 2: Theme, most students were on the right track, though a few submitted modern and contemporary topics for Survey I. For this step, students submitted brief statements (approx. 100 words) describing their exhibition themes and what types of works they anticipated including in their projects. Step 3 asked for a list of artworks to be included in the exhibition – five works for each group member. 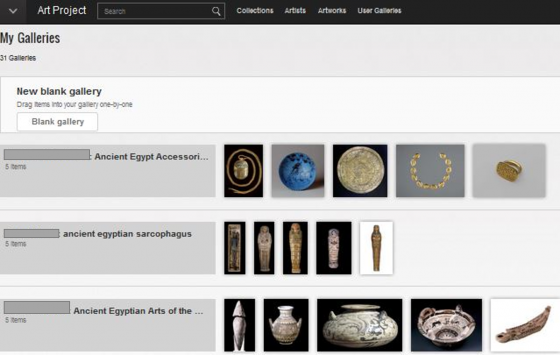 This step required the students to start using Google Art Project (GAP) which brought on another onslaught of emails from confused and frustrated students. I chose GAP because it touts the ability to create your own member galleries and exhibitions, drawing from their vast repository of high-definition images. Unfortunately, the exhibition format is not user-friendly and I had as much difficulty as my students learning how to navigate the program. Eventually I created a step-by-step guide for using GAP, but that meant more work for me and more reading for my students. It is not easy asking students to master a new technology during the course of an 8-week semester, but they pushed forward, thankfully. For the fourth step, students submitted short summaries or bullet points of important information about each work of art they chose in the previous step. The fifth step required the students to work together to compose the introductory wall text for the virtual exhibition. This step posed more problems for group work than previous steps because it required students to collaborate on writing and revision. In most groups, one student took the initiative to write the initial draft followed by group revisions. In Week 7, the students submitted “rough drafts” of their work –links to their exhibitions in GAP for which they received substantial feedback. By Week 8 the groups completed all editing and revisions based on my feedback and submitted the link for their final projects. I was thrilled to see that my students had managed to create quality exhibitions despite the trial-and-error nature of the project. More importantly, they appeared to have met the assignment learning outcome: to critically analyze and synthesize art objects to curate a coherent exhibition; comprehend the meaning of works of art and how they functioned originally within the historical, social, religious, cultural, and political context in which they were made; identify correspondences between technical procedures (artist’s intentions) and their purposeful communicative and cultural functions; and master the skills of formal analysis and description in order to analyze works of art in terms of their content; to describe the subject matter of an image, its literary sources, and iconographical tradition, as well as to describe the formal properties of works of art, that is, to analyze composition, technique, scale, location, and use of materials. Along the way I made some modifications based on student feedback. For example, I created group discussion board forums with different discussion boards for each step of the project. One group decided to skip Blackboard and use Google Hang-outs since they could download the app on their phones rather than having to be at home to access Blackboard on their computers. Also, they were able to get notifications when group members posted comments and assignments. If I were to teach this course as an online group project in the future, I think notifications for posts would be an essential component. Notifications would keep students involved as the project develops live over the course of each week, a sort of virtual group unification. Another change I would make would be to group my students according to time-zone since this seemed to be the biggest hurdle students faced – waiting on each other. Overall, the project was successful and I received extremely positive feedback from students, course designers, and faculty evaluators. Besides the issue of collaborative online work, my biggest concern is the limited usefulness of Google Art Project. The complex and convoluted program continues to confuse my students, but once they figure it out, they excel academically. In the end, I streamlined the process after the first semester to include fewer steps and switched from group to individual based on student concerns. I will cover the ups and downs of the Google Art Project Virtual Exhibition assignment in a subsequent post! This is great. Since I am teaching a hybrid class this fall to my introductory (Caves to Cathedrals) AHY class, I may use this as a great final project (rather than exam). Thanks! Thank you for your and your student’s terrific effort. I would certainly use your example here for my online courses in African American art history survey and Museum History and Theory. I elk be passing your project along to my museum studies colleague. I used Google Aft Project for the first time ever this semester, for my onsite Non-Western Survey class! Each student created their own gallery (I didn’t have group projects, which I avoid due to the reasons your students cited). Each student had to pick a culture studied in class and a theme for their gallery. They were not allowed to use European style art but had to use examples from their chosen culture’s tradition. They had to Reseacrch outside Google art project to find information and references to support their “Curator’s Statemenf” (big TEXTBOX at beginning of Google galleries) and also for their informational labels (text boxes by each image) and cite their sources in MLA format. I had them write informal reviews for me of the class this week (oir last meeting): one thing they would change about the class and one thing they’d keep. Many students cited the Google Art Gallery as something they would want me to keep… Most of them loved it! There were some trying moments at the beginning with getting links to their galleries to work (can’t be in edit mode or link won’t work, they have to remember to make it public or link won’t work, etc). Many students even stayed after class to rave about it! A couple students wrote they would rather have term papers which surprised me a lot, but if I ever teach the class again I will definitely have a term paper option for those exceptions to the rule. Pedagoglically, it was a major success. It got students looking at and thinking about art in new ways, and enhanced their appreciation for and understanding of non-western Art in a fun and un-intimidating way. (Since many US undergrads are intimidated or uninterested in non-western art, this approach really was great! It’s not the best either but perhaps simpler than GAP. Thank you! This is fascinating! My art history course for engineers meets on campus and at the museum, so I will need to modify some components, but this will definitely be an interesting break from the traditional research paper. Can’t wait to try it out! I don’t think I’ve lost it. However, I’ve spent days trying to figure out how to start curating an exhibit in GAP! How can I assign as a final art history project for my community college students to “curate an exhibit” if I can’t figure it out myself! Please tell me what I am missing here! Soon! Last three weeks of classes are upon us. Does this app still work? I’ve downloaded it from Web Catalog as instructed – I’ve added the extension. Why don’t I see the button every help GA&C Help page says exists? Please help!!! Unfortunately, GAP did away with this feature a few months after I wrote this post. I wrote about some alternatives to GAP in my follow up post on 12/02/2016 Google Art Project to Prezi: Jackson Pollock and Thomas Kinkade. I’ve found that students enjoy Prezi and it makes for an engaging online presentation program in which to create virtual exhibitions. I am currently writing a post about how various alternatives work based on my trial-and-error experience. I will let you know as soon as my new post is available.